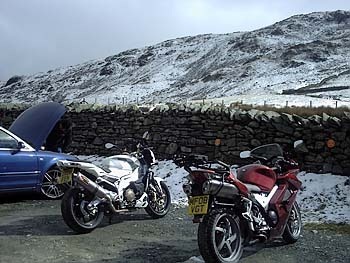 Had a run out today up to Kirkstone Inn with Scotsy and CJ from NUKB. We caught the snow as we were about to leave Kirkstone so headed home via Rivington Barn and manage to get back just as the big stuff starting falling. 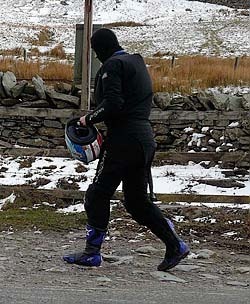 It was the same day that they cancelled British Superbikes at Brands Hatch because of snow, most on NUKB thought we were mad but we had a good run and a good laugh. It was bloody cold though, but the scuba suit works great.